"Tatar" redirects here. For other uses, see Tatar (disambiguation). The Tatars (/ˈtɑːtərz/; Tatar: татарлар, tatarlar; Russian: татары) are a Turkic-speaking people living mainly in Russia and other Post-Soviet countries. The name Tatar first appears in written form on the Kul Tigin monument as 𐱃𐱃𐰺 (Ta-tar). Historically, the term Tatars was applied to anyone originating from the vast Northern and Central Asian landmass then known as the Tartary, which was dominated by various mostly Turco-Mongol semi-nomadic empires and kingdoms. More recently, however, the term refers more narrowly to people who speak one of the Turkic languages. The Mongol Empire, established under Genghis Khan in 1206, allied with the Tatars. Under the leadership of Genghis Khan's grandson Batu Khan (c. 1207–1255), the Mongols moved westwards, driving with them many of the Mongol tribes toward the plains of Kievan Rus'. The "Tatar" clan still exists among the Mongols, Hazaras and Uzbeks. The largest group by far that the Russians have called "Tatars" are the Volga Tatars, native to the Volga region (Tatarstan and Bashkortostan), who for this reason are often also simply known as "Tatars". They compose 53% of population in Tatarstan. Their language is known as the Tatar language. As of 2002[update] they had an estimated population around 5 million in Russia as a whole. There is a common belief that Russians and Tatars are closely intermingled, illustrated by the famous saying "scratch any Russian just a little and you will discover a Tatar underneath" and the fact that a number of noble families in Tsardom of Russia and Polish-Lithuanian Commonwealth had Tatar origins; however, genetics show that majority of Russians form a cluster with Northern and Eastern Europeans (especially Belarusians, Ukrainians and Poles), and are relatively far from Tatar peoples. In modern-day Tatarstan, however, Russian-Tatar marriages are very common. Owing to their diverse heritage, Tatars have a vast range of appearances, ranging from East Asian to European. The name "Tatar" likely originated amongst the nomadic Mongolic-speaking Tatar confederation in the north-eastern Gobi desert in the 5th century. The name "Tatar" was first recorded on the Orkhon inscriptions: Kul Tigin (CE 732) and Bilge Khagan (CE 735) monuments as : : Otuz Tatar Bodun ('Thirty Tatar' clan) and : Tokuz Tatar ('Nine Tatar') referring to the Tatar confederation. "Tatar" became a name for populations of the former Golden Horde in Europe, such as those of the former Kazan, Crimean, Astrakhan, Qasim, and Siberian Khanates. The form "Tartar" has its origins in either Latin or French, coming to Western European languages from Turkish and the Persian language (tātār, "mounted messenger"). From the beginning, the extra r was present in the Western forms, and according to the Oxford English Dictionary this was most likely due to an association with Tartarus. The Persian word is first recorded in the 13th century in reference to the hordes of Genghis Khan and is of unknown origin, according to OED "said to be" ultimately from tata, a name of the Mongols for themselves. The Arabic word for Tatars is تتار. Tatars themselves wrote their name as تاتار or طاطار. The Chinese term for Tatars was Dada 韃靼, especially after the end of the Yuan period (14th century), but also recorded as a term for Mongolian-speaking peoples of the northern steppes during the Tang period (8th century). The name "Tatars" was used as an alternative term for the Shiwei, a nomadic confederation to which these Tatar people belonged. Russians and Europeans used the name Tatar to denote Mongols as well as Turkic peoples under Mongol rule (especially in the Golden Horde). Later, it applied to any Turkic or Mongolic-speaking people encountered by Russians. Eventually, however, the name became associated with the Turkic Muslims of Ukraine and Russia, namely the descendants of Muslim Volga Bulgars, Kipchaks, Cumans, and Turkicized Mongols or Turko-Mongols (Nogais), as well as other Turkic-speaking peoples (Siberian Tatars, Qasim Tatars, and Mishar Tatars) in the territory of the former Russian Empire (and as such generally includes all Northwestern Turkic-speaking peoples). Nowadays Tatar is usually used to refer to the people, but Tartar is still almost always used for derived terms such as tartar sauce, steak tartare, and the Tartar missile. All Turkic peoples living within the Russian Empire were named Tatar (as a Russian exonym). Some of these populations still use Tatar as a self-designation, others do not. The name Tatar is also an endonym to a number of peoples of Siberia and Russian Far East, namely the Khakas people. As various nomadic groups became part of Genghis Khan's army in the early 13th century, a fusion of Mongol and Turkic elements took place, and the invaders of Rus' and the Pannonian Basin became known to Europeans as Tatars or Tartars (see Tatar yoke). After the breakup of the Mongol Empire, the Tatars became especially identified with the western part of the empire, known as the Golden Horde. The Mongol dominance in Central Asia was absolute during the 14th and 15th centuries. The Crimean-Nogai raids into Russia and Polish–Lithuanian Commonwealth aimed especially at the capture of slaves, most of whom were exported to the Ottoman Empire. The raids were an important drain of the human and economic resources of both countries. They largely prevented the settlement of the "Wild Fields" – the steppe and forest-steppe land that extends from a hundred or so miles south of Moscow to the Black Sea. 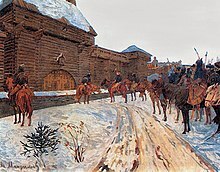 The raids were also important in the development of the Cossacks. The end of absolute Tatar dominance came in the late 15th century, heralded by the Great stand on the Ugra river in 1480. During the 16th through 18th centuries, the gradual expansion of Russia led to the absorption of the Tatar khanates into Russian territory. The Crimean Tatars attacked Russia in 1507, followed by two centuries of Russo-Crimean Wars for the Volga basin. Similarly, the Russo-Kazan Wars lasted for the best part of a century and ended with the Russian conquest of the Kazan khanate. The last of the Tatar khanates, the Kazakhs, remained independent until 1822. Their last ruler, Kenesary Khan, was proclaimed khan of the Kazakhs when the Russian Empire was already fully in control of Kazakhstan; Russian law prohibited the Kazakhs from selecting their leader after 1822. The popular rise of Kenesary Khan was in defiance of Russian control of Kazakhstan, and his time as khan was spent on continuous fighting with the Russian imperial forces until his death in 1847. 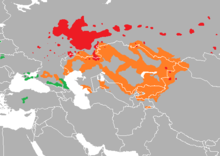 The Tatar language, together with the Bashkir language, forms the Kypchak-Bolgar (also "Uralo-Caspian") group within the Kipchak languages (also known as Northwestern Turkic). There are two Tatar dialects - Central and Western. The Western dialect (Misher) is spoken mostly by Mishärs, the Central dialect is spoken by Kazan and Astrakhan Tatars. All two dialects have subdialects. Central Tatar furnishes the base of literary Tatar. The Siberian Tatar language are independent of Volga–Ural Tatar. The dialects are quite remote from Standard Tatar and from each other, often preventing mutual comprehension. The claim that Siberian Tarar is part of the modern Tatar language is typically supported by linguists in Kazan and denounced by Siberian Tatars. Crimean Tatar is the indigenous language of the Crimean Tatar people. Because of its common name, Crimean Tatar is sometimes mistakenly seen as a dialect of Kazan Tatar. Although these languages are related (as both are Turkic), the Kypchak languages closest to Crimean Tatar are (as mentioned above) Kumyk and Karachay-Balkar, not Kazan Tatar. The majority of the Tatar population are Volga Tatars, native to the Volga region, and the Crimean Tatars of Crimea. There are smaller groups of Lipka Tatars and Astrakhan Tatars in Europe and the Siberian Tatars in Asia. The present territory of Tatarstan was inhabited by the Volga Bulgars, who settled on the Volga river in the 7th century AD and converted to Islam in 922 during the missionary work of Ahmad ibn Fadlan. After the Mongol invasion, Volga Bulgaria was annexed by the Golden Horde. Most of the population survived, and there may have been a certain degree of mixing between it and the Kipchaks of the Horde during the ensuing period. The group as a whole accepted the exonym "Tatars" (finally in the end of the 19th century; although the name Bulgars persisted in some places; the majority identified themselves simply as the Muslims) and the language of the Kipchaks; on the other hand, the invaders eventually converted to Islam. As the Horde disintegrated in the 15th century, the area became the territory of the Kazan khanate, which was ultimately conquered by Russia in the 16th century. Some Volga Tatars speak different dialects of Tatar language. Therefore, they form distinct groups such as the Mişär group and the Qasim group. Mişär-Tatars (or Mishars) are a group of Tatars speaking a dialect of the Tatar language. They live in Chelyabinsk, Tambov, Penza, Ryazan, Nizhegorodskaya oblasts of Russia and in Bashkortostan and Mordovia. They lived near and along the Volga River, in Tatarstan. The Western Tatars have their capital in the town of Qasím (Kasimov in Russian transcription) in Ryazan Oblast, with a Tatar population of 1100. A minority of Christianized Volga Tatars are known as Keräşens. The Volga Tatars used the Turkic Old Tatar language for their literature between the 15th and 19th centuries. It was written in the İske imlâ variant of the Arabic script, but actual spelling varied regionally. The older literary language included a large number of Arabic and Persian loanwords. The modern literary language, however, often uses Russian and other European-derived words instead. Outside of Tatarstan, urban Tatars usually speak Russian as their first language (in cities such as Moscow, Saint-Petersburg, Nizhniy Novgorod, Tashkent, Almaty, and cities of the Ural and western Siberia) and other languages in a worldwide diaspora. In the 1910s the Volga Tatars numbered about half a million in the Kazan Governorate in Tatarstan, their historical homeland, about 400,000 in each of the governments of Ufa, 100,000 in Samara and Simbirsk, and about 30,000 in Vyatka, Saratov, Tambov, Penza, Nizhny Novgorod, Perm and Orenburg. 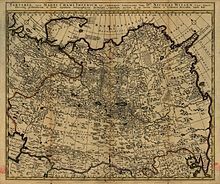 An additional 15,000 had migrated to Ryazan or were settled as prisoners in the 16th and 17th centuries in Lithuania (Vilnius, Grodno and Podolia). An additional 2000 resided in St. Petersburg. Most Kazan Tatars practice Sunni Islam. The Kazan Tatars speak the Tatar language, a Turkic language with a substantial amount of Russian and Arabic loanwords. Before 1917, polygamy was practiced only by the wealthier classes and was a waning institution. A significant number of Volga Tatars emigrated during the Russian Civil War, mostly to Turkey and Harbin, China. According to the Chinese government, there are still 5,100 Tatars living in Xinjiang province. Cossacks fighting Tatars of Crimea. The number of Crimean Tatars is estimated at 650,000. The Crimean Tatars emerged as a nation at the time of the Crimean Khanate. The Crimean Khanate was a Turkic-speaking Muslim state that was among the strongest powers in Eastern Europe until the beginning of the 18th century. The nobles and rulers of the Crimean Tatars were the descendants of Hacı I Giray, a Jochid descendant of Genghis Khan, and of Batu Khan of the Mongol Golden Horde. The Crimean Tatars mostly adopted Islam in the 14th century and thereafter Crimea became one of the centers of Islamic civilization. The Khanate was officially a vassal state of the Ottoman Empire with great autonomy after 1448. 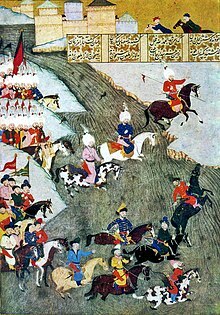 The Russo-Turkish War (1768–74) resulted in the defeat of the Ottomans by the Russians, and according to the Treaty of Küçük Kaynarca (1774) signed after the war, Crimea became independent and Ottomans renounced their political right to protect the Crimean Khanate. After a period of political unrest in Crimea, Russia violated the treaty and annexed the Crimean Khanate in 1783. The Crimean Tatars are subdivided into three sub-ethnic groups: the Tats (not to be confused with Tat people, living in the Caucasus region) who used to inhabit the mountainous Crimea before 1944 (about 55%), the Yalıboyu who lived on the southern coast of the peninsula (about 30%), and the Noğay (about 15%). Crimean Tatars have been present on the territory of today's Romania and Bulgaria since the 13th century. In Romania, according to the 2002 census, 24,000 people declared their ethnicity as Tatar, most of them being Crimean Tatars living in Constanța County in the region of Dobrogea. The Crimean Tatars were colonized there by the Ottoman Empire beginning in the 17th century. The Lipka Tatars are a group of Turkic-speaking Tatars who originally settled in the Grand Duchy of Lithuania at the beginning of the 14th century. The first settlers tried to preserve their shamanistic religion and sought asylum amongst the non-Christian Lithuanians. Towards the end of the 14th century, another wave of Tatars—Muslims, this time—were invited into the Grand Duchy by Vytautas the Great. These Tatars first settled in Lithuania proper around Vilnius, Trakai, Hrodna and Kaunas and later spread to other parts of the Grand Duchy that later became part of Polish–Lithuanian Commonwealth. These areas comprise present-day Lithuania, Belarus and Poland. From the very beginning of their settlement in Lithuania they were known as the Lipka Tatars. From the 13th to 17th centuries various groups of Tatars settled and/or found refuge within the Polish-Lithuanian commonwealth. This was promoted especially by the Grand Dukes of Lithuania because of their reputation as skilled warriors. The Tatar settlers were all granted szlachta (nobility) status, a tradition that was preserved until the end of the Commonwealth in the 18th century. They included the Lipka Tatars (13th–14th centuries) as well as Crimean and Nogay Tatars (15th–16th centuries), all of which were notable in Polish military history, as well as Volga Tatars (16th–17th centuries). They all mostly settled in the Grand Duchy of Lithuania. Various estimates of the number of Tatars in the Commonwealth in the 17th century are about 15,000 persons and 60 villages with mosques. Numerous royal privileges, as well as internal autonomy granted by the monarchs, allowed the Tatars to preserve their religion, traditions, and culture over the centuries. The Tatars were allowed to intermarry with Christians, which was uncommon in Europe at the time. The May Constitution of 1791 gave the Tatars representation in the Polish Sejm. Although by the 18th century the Tatars adopted the local language, the Islamic religion and many Tatar traditions (e.g. the sacrifice of bulls in their mosques during the main religious festivals) were preserved. This led to formation of a distinctive Muslim culture, in which the elements of Muslim orthodoxy mixed with religious tolerance formed a relatively liberal society. For instance, the women in Lipka Tatar society traditionally had the same rights and status as men, and could attend non-segregated schools. About 5,500 Tatars lived within the inter-war boundaries of Poland (1920–1939), and a Tatar cavalry unit had fought for the country's independence. The Tatars had preserved their cultural identity and sustained a number of Tatar organisations, including a Tatar archives and a museum in (Vilnius). The Tatars suffered serious losses during World War II and furthermore, after the border change in 1945, a large part of them found themselves in the Soviet Union. It is estimated that about 3000 Tatars live in present-day Poland, of which about 500 declared Tatar (rather than Polish) nationality in the 2002 census. There are two Tatar villages (Bohoniki and Kruszyniany) in the north-east of present-day Poland, as well as urban Tatar communities in Warsaw, Gdańsk, Białystok, and Gorzów Wielkopolski. Tatars in Poland sometimes have a Muslim surname with a Polish ending: Ryzwanowicz; another surname sometimes adopted by more assimilated Tatars is Tatara or Tataranowicz or Taterczyński, which literally mean "son of a Tatar". A small community of Polish-speaking Tatars settled in Brooklyn, New York City, in the early 20th century. They established a mosque that is still in use today. The Astrakhan Tatars (around 80,000) are a group of Tatars, descendants of the Astrakhan Khanate's population, who live mostly in Astrakhan Oblast. For the Russian census in 2010, most Astrakhan Tatars declared themselves simply as Tatars and few declared themselves as Astrakhan Tatars. A large number of Volga Tatars live in Astrakhan Oblast and differences between them have been disappearing. The Siberian Tatars occupy three distinct regions—a strip running west to east from Tobolsk to Tomsk—the Altay and its spurs—and South Yeniseisk. They originated in the agglomerations of various indigenous North Asian stems that, in the region north of the Altay, reached some degree of culture between the 4th and 5th centuries, but were subdued and enslaved by the Mongols. The 2010 census recorded 6,779 Siberian Tatars in Russia. According to the 2002 census there are 500,000 Tatars in Siberia, but 400,000 of them are Volga Tatars who settled in Siberia during periods of colonization. 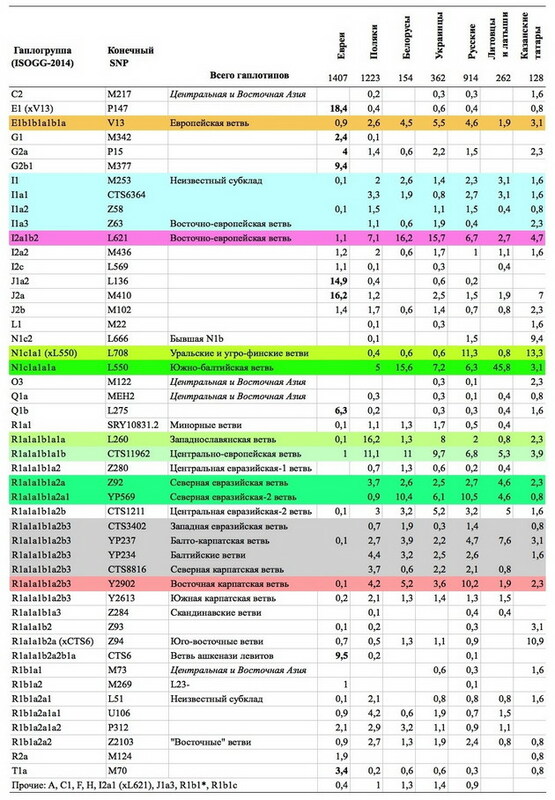 According to over 100 samples from the Tatarstan DNA project, the most common Y-DNA haplogroup of the ethnic Volga Tatars is Haplogroup R1a (over 20%), predominantly from the Asian R1a-Z93 subclade. Haplogroup N is the other significant haplogroup. According to different data J2a or J2b may be the more common subclade of Haplogroup J2 in Volga Tatars. The haplogroups C and Q are among the rare haplogroups. It was found that mtDNA of the Volga Tatars consists of two parts, but western Eurasian component prevails considerably (84% on average) over eastern Asian one (16%). among 197 Kazan Tatars and Mishars. Together with Tatars, Russians have high frequencies of allele families and haplotypes characteristic of Finno-Ugric populations. This presupposes a Finno-Ugric impact on Russian and Tatar ethnogenesis.... Some aspects of HLA in Tatars appeared close to Chuvashes and Bulgarians, thus supporting the view that Tatars may be descendents of ancient Bulgars. Among Tobol-Irtysh group of Siberian Tatars, the most common Y-DNA haplogroups are Haplogroup N1c2b, Haplogroup N1c1a and Haplogroup Q-M242. Lipka Tatars have, autosomally, about 1/3 Eastern Eurasian and 2/3 Western Eurasian genetic fond. Tatar elder and his horse. The word Qazan – قازان is written in Yaña imlâ in the semblance of a Zilant. Cover page of Tatar Yana imla book, printed with Separated Tatar language in Arabic script in 1924. A Tatar alphabet book printed in 1778. Arabic script is used, Cyrillic text is in Russian. Хальфин, Сагит. Азбука татарского языка. — М., 1778. — 52 с.
Tatar sign on a madrasah in Nizhny Novgorod, written in both Arabic and Cyrilic Tatar scripts. ^ "Tatars facts, information, pictures - Encyclopedia.com articles about Tatars". www.encyclopedia.com. ^ "Ethnic composition of Romania 2011". ^ "Rustam Minnikhanov meets representatives of the Tatar Diaspora in Switzerland". ^ "Tatars". World Culture Encyclopedia. Retrieved 14 March 2018. ^ a b c d One or more of the preceding sentences incorporates text from a publication now in the public domain: Kropotkin, Peter; Eliot, Charles (1911). "Tatars" . In Chisholm, Hugh (ed.). Encyclopædia Britannica. 28 (11th ed.). Cambridge University Press. pp. 448–449. ^ Orekhov, V; Poltoraus, A; Zhivotovsky, LA; Spitsyn, V; Ivanov, P; Yankovsky, N (1999). "Mitochondrial DNA sequence diversity in Russians". FEBS Lett. 445 (1): 197–201. doi:10.1016/s0014-5793(99)00115-5. PMID 10069400. ^ "Взаимоотношения супругов в моно- и полиэтнических браках русских и татар". 2010. ^ "Kül Tiğin (Gültekin) Yazıtı Tam Metni (Full text of Kul Tigin monument with Turkish transcription)". Retrieved 5 April 2014. ^ "Bilge Kağan Yazıtı Tam Metni (Full text of Bilge Khagan monument with Turkish transcription)". Retrieved 5 April 2014. ^ "The Kultegin's Memorial Complex". Retrieved 5 April 2014. ^ Ross, E. Denison; Vilhelm Thomsen (1930). "The Orkhon Inscriptions: Being a Translation of Professor Vilhelm Thomsen's Final Danish Rendering". Bulletin of the School of Oriental Studies, University of London. 5 (4, 1930): 861–876. doi:10.1017/S0041977X00090558. JSTOR 607024. ^ Thomsen, Vilhelm Ludvig Peter (1896). Inscriptions de l'Orkhon déchiffrées. Helsingfors, Impr. de la Société de littérature finnoise. p. 140. 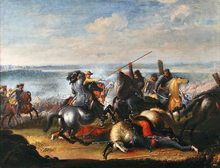 ^ citing a letter to St Louis of Frances dated 1270 which makes the connection explicit, "In the present danger of the Tartars either we shall push them back into the Tartarus whence they are come, or they will bring us all into heaven"
^ Wedgwood, Hensleigh (1855). "On False Etymologies". Transactions of the Philological Society (6): 72. ^ Chen Dezhi 陳得芝, Jia Jingyan 賈敬顔 (1992). "Dada 達靼", in: Zhongguo da baike quanshu 中國大百科全書, Zhongguo lishi 中國歷史, vol. 1, pp. 132-133. Cited after "Dada 韃靼 Tatars" by Ulrich Theobald, chinaknowledge.de. ^ Oxford Dictionaries: Tatar – a member of a Turkic people living in Tatarstan and various other parts of Russia and Ukraine. ^ "Tartar, Tatar, n.2 (a.)". (1989). In Oxford English Dictionary. Retrieved 11 September 2008, from Oxford English Dictionary Online. 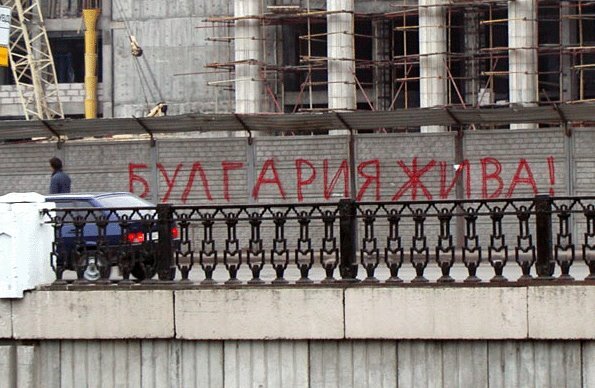 ^ Татары (in Russian). Энциклопедия «Вокруг света». Retrieved 29 May 2014. ^ Mikhail, Kizilov (2007). "Slave Trade in the Early Modern Crimea From the Perspective of Christian, Muslim, and Jewish Sources". Journal of Early Modern History. 11 (1): 1–31. doi:10.1163/157006507780385125. ^ Culture of Tartars (PDF). ^ "Family Tree DNA - Tatarstan". www.familytreedna.com. ^ Malyarchuk, Boris; Derenko, Miroslava; Denisova, Galina; Kravtsova, Olga (1 October 2010). "Mitogenomic Diversity in Tatars from the Volga-Ural Region of Russia". Molecular Biology and Evolution. 27 (10): 2220–2226. doi:10.1093/molbev/msq065. ISSN 0737-4038. PMID 20457583.